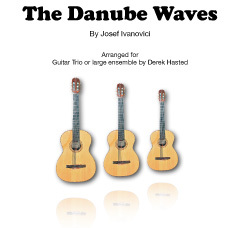 I'm pleased to tell you about another arrangement that is now published - the well-known "Danube Waves" - a set of four Waltzes that can be played individually or in sequence. You'll find dozens of versions on YouTube for piano and for full orchestra, but now you can download a version for 3 guitars or large ensemble. In this arrangement (which includes a new and mood-setting introduction), the roles of tune, countermelody and accompaniment switch between players at each new phrase, so everyone gets a share of the limelight.